Our courses are not integration courses but courses for motivated and ambitious participants who pay for them themselves. What is different about TASI? Every week we offer short tests, after 4 weeks a mid-term exam, after 8 weeks the final exam. 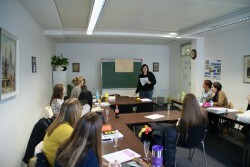 We practise grammar very intensively in order for you to feel comfortable with the German language. Not only do we read the texts but we also discuss them in detail. The teachers are happy to explain what you are proficient at and what needs a little more work. Without a background knowledge of culture it is impossible to fully understand texts. That’s why we practise together. Writing is a lot of work, however, this is the only way to learn German. Homework is extremely important because you can learn a lot by yourself. We organize trips, guided city tours, get-togethers, seminars and presentations for you. Most participants at TASI have the goal of studying at university or have professions with high qualification. We explain exactly what you have to do in order to qualify for the exams. At TASI grades are not given away but there are objectives grades for good performance. The lessons help you to reach your goals as quickly as possible. You learn everthing you actually need. Internal and external experts advise us so that we can always offer the best classes for you. We work together with many regional educational institutions so that we can quickly and competently support you. Personal advice goes without saying for us. We want you to reach your goals in the best way! Trier is an open-minded university city in the South-West of Germany in the heart of Europe. Here you find cultural and lingual diversity, numerous Roman landmarks and above all the closeness to Luxemburg, France, Belgium and the Netherlands. We help you see the big advantages of this region because we want you to be able to do your own thing and feel comfortable here. If you have special interests, don’t hesitate to talk to us or write an e-mail. Fotos unserer Aktivitäten finden Sie auf unserer facebook-Seite.